Goya California Pearl Rice is often used in Cuban Cuisine. 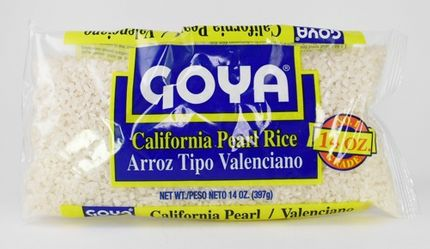 Goya California Pearl Rice is ideal to make paella, rice with chicken or rice with seafood. Ingredients: Short grain rice enriched with iron (ferric orthophosphate), niacin, and thiamine (thiamine mononitrate). Arroz Tipo Valenciano Goya / Goya California Rice Paquete de 3El Arroz Tipo Valenciano de Goya es usado en la cocina Cubana. El Arroz Tipo Valenciano de Goya es ideal para hacer paellas, el famoso Arroz con Pollo y Arroz con mariscos. Ingredientes: Arroz de grano corto enriquecido con hierro (ortofosato ferrico), niacina y tiamina (mononitrato tiamina). Hard to believe that despite all the labeling on the bag, there were NO cooking instructions other than for use as a chicken dish. Had to go on line and even then Goya did not have their specific instructions. ProsVery good rice, once you figure out how to cook it. No directions on how to cook on label or on line. Hard to surprise the wife with this lack of suport!